Carole, I thought you would want these photos. Thanks again for the really outstanding class. Ike is just a sweetie -- pleasant and well socialized. We credit much of his confidence and well-mannered behavior to his puppy kindergarten with C&C PALS! We're trying to keep up the great training you got us started with. We felt right at home with your direct approach to positive training. Please keep us posted on the intermediate class. I'll try to bring Ike to playgroup next week. In the meantime, we'll keep working with him. We just wanted to thank you and your staff for all you taught us and Samantha in your class. We were unable to take your last class due to scheduling conflicts. Disappointing because we were able to teach Sam to shake. Thanks for the lead on White Dog Bone Company for treats. You do a great job and really put your heart into your work. Thanks Again! Carole, I would like to thank you for all the help and training you gave Sonny and me. As you know, Sonny had an aggression problem. We went through the traditional dog training method, which did not help. It actually made the situation worse since he stopped giving warning signs, like barking and growling. The conditioning training that you provided made a tremendous difference and in a much shorter period of time than expected (1 month). We were able to take Sonny to a busy shopping center, which he enjoyed and showed no signs of aggression or fear. I have also seen improvement in the home. Sonny is not as protective with delivery people or others who stop by. Again, the training you provided us made a world of difference for my wonderful, large Briard. Thank you. Carole, Sorry I had to miss the last two classes. I just wanted to say thank you! I learned a great deal from the classes and you. I have always loved my dogs but look at them differently after learning from you and reading the books you recommended. Satchel has become a much better listener. I am also able to have him lay on his back and have me pet his stomach without him resisting me. I do not spend an hour training them but have taken them off welfare :-) Both sit before they eat and look at me to release them before they dig in. A sit is required before they are let off leash or given a treat. Both are required to stay before they can jump out of the car. A sit is required while collars are being snapped on and a stay before I open the door. I am exposing Gibson to more action, such as people walking, running and biking in the park. My husband takes her to work a few times a week so she gets more exposure to noise and people. We still have work to do, but I am focusing on the progress both have made. So I just want to say thank you. Before my husband came into my life, I lived with Galen, my 75-pound shepherd. He was rescued from the pound four years earlier, and continued to have problems of aggression, fear, and territory issues. Galen was my life, and he had me all to himself. When I started dating my husband, Galen decided he wasn't too keen on sharing the house or me. I had been working with Carole since 1999. She explained what was going on with Galen, why he was reacting the way he was, and then she gave us concrete training steps using positive reinforcement to help change the behavior. Everything Carole has instructed us to do has led to a positive change in Galen's behavior. Carole is great to work with and always explains whatever options might be available, such as managing the problem, avoidance, correcting a problem in real time, or working to positively shape the behavior. Carole suggested that my husband should give Galen his food and any treats. Sure enough, over time, Galen now associates my husband with food and all things good. Thanks to Carole my husband can enter the house! Carole Peeler is a dedicated professional. She is also a gifted trainer. Thanks to her positive approach to learning, my dogs and I now share a richer lifestyle than I would ever have thought possible. Thanks Carole! After a few unsuccessful attempts to have my sweet Golden girl Kayla earn her CGC, I knew there was only one place to go for assistance. After enrolling in Carole's CGC class and under her professional tutelage, I can proudly say my girl passed her CGC test. I owe Carole and her staff a great debt of thanks. Wahoo! -Carol Rodekohr Pawnee's Ante up CGC "Kayla"
Dear Carole, It was a real pleasure meeting you yesterday. We really appreciate your taking time out of your schedule to address our group. Your presentation was a huge success. The evaluation sheets were full of compliments. Carole, we do hope you will come back when we have future forums. Thank you so much for your time. 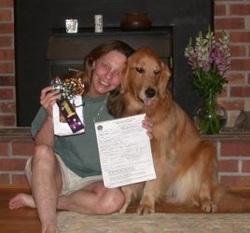 "Duncan was adopted from Friends of Homeless Animals at 10 months. His nickname could be "Will Rogers" as he never met a stranger he didn't lick. His exuberance in meeting people, however, led to his two biggest bad habits: jumping and licking!!! Duncan also would bolt through any open door; a closed screened door was no impediment! Duncan would also have an onset of "selective deafness" when pursuing a squirrel in the backyard. Obedience training was in the cards for Duncan. 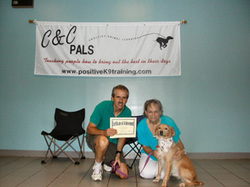 He enrolled in the Adult Basic Obedience Class at C&C Pals. With Duncan's willingness to work for treats, paired with positive reinforcement training at C&C Pals, Duncan has been a delight and joy to train. Duncan was voted valedictorian of his class. Duncan can now control his licker and suppress his desire to jump. Duncan will now "sit" anytime a door is opened and wait until given the hand signal to go through. Duncan hopes to continue his training and become accepted as a pet therapy dog with Pets on Wheels." I just wanted to let you know how very much Harris and I enjoyed your classes, and also how much I appreciated your excellent teaching methods in training me to train my puppy/dog to become a better canine citizen. 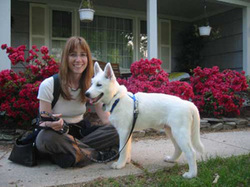 I especially commend your method of teaching the owners the basics of each command; i.e., the way you break down each new command so that the dog learns in phases, and is not overwhelmed with more than he can absorb, shows that you have a deep understanding into the methodology of animal training. You always take extra time with each participant to help them master a new command, interjecting suggestions when we are having problems. Each class session you come with a well-prepared lesson plan which emphasizes to me how totally committed you are to your profession. Above all is your kindness to the animal -- your method of using rewards and praise instead of force is a welcome change from the other dog training techniques. We both feel truly honored to have been a member of your classes, and I cherish you as a friend. A few weeks after we brought Tyler, a Norwegian Elkhound mix, home from the Humane Society shelter, it was clear we needed some help. Tyler had no known history, as he had been a stray. As best we could determine, he was about 1 1/2 years old. He had a wonderfully sweet demeanor, was especially gentle with Alex, our 14-year-old Golden, and was very friendly with everyone he met. Sometimes, however, he showed his affection in inappropriate ways -- jumping, mouthing, etc. -- and was a bit pushy, too. He also had a breathtaking rambunctious streak and was, on a couple of occasions, a bit aggressive in his play. 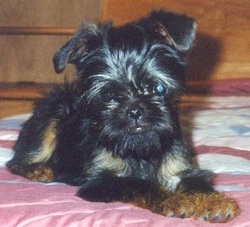 Bottom line, Tyler was an untrained puppy in a grown dog's body. On the recommendation of Pam Reid, one of the leading animal behaviorists in North America, we called Carole to help evaluate Tyler. From the moment Carole walked into the house, Tyler was under her spell. Carole revved him up and let him fly and, just as quickly, recaptured his attention. Her upbeat manner had Tyler working and having fun all at once. We had fun watching the two of them interact. Carole was equally adept at communicating with us. She fully explained her positive training philosophy and presented a program that addressed both short-term and long-term goals. Carole gave us the tools and, perhaps more important, the confidence to make things work. That was three months ago. With a little time each day and continued guidance from Carole, the progress has been astounding. Tyler is now a polite and well-behaved host. He is as enthusiastic and exuberant as ever, but now knows the boundaries. There is more to be done, as there always is, but we are all having great fun learning. That's the best part. Carole's technique is about more than obedience -- it's about nurturing a happy dog who is obedient. We are all very fond of Carole, but no one enjoys her visits more than Tyler, who is always tail-thumping excited when she is at the door. We have already recommended her to several friends. Her positive attitude is infectious, and we can't imagine that there is a better teacher out there. With encouragement from Carole Peeler and support from our veterinarian, I enrolled our puppy, Harley (an Italian Spinone), in Carole's puppy kindergarten class three days after bringing him home. He was eight weeks old and was going to grow into one large pup before long. My eight-year-old daughters were afraid of Harley (and most dogs), as he was already big and nipping at their heels and clothing, as pups will do. We all attended the classes as I saw it as an invaluable set of skills for all of my kids to learn. All of us, including Harley, enjoyed Carole, the atmosphere, and all the pups, and this prompted us to enroll Harley in a second kindergarten session following the first session. Not only did we get to see lots of really cool dogs, but by the end of the first session, my most anxious daughter (who wouldn't get out of her chair when Harley was around) was training Harley during his end-of-session competition. We continue to receive complements about how well behaved Harley is and look forward to working with Carole with the next level of instruction and will seek her assistance when we pursue canine good citizenship. Carole truly loves her work and has such respect for dogs they are immediately drawn to her. She is fun, encouraging, and thorough with her instruction. She wants her clients to leave with much more than they pay for in hopes that people and their dogs can look forward to many years of companionship together. Do we have wonderful things to say about Carole Peeler? You betcha! There aren't too many more important things in life than the family dog, at least around our house. We had a great time and learned a lot! Thank you for training us!